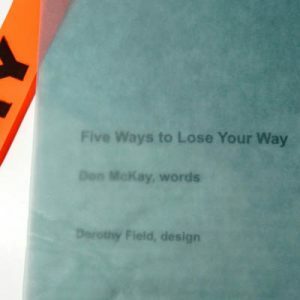 Don McKay has published eight books of poetry, including Birding, Or Desire (1983), Night Field (1991), and Apparatus (1997). He has received a number of awards, including the 2007 Griffin Prize for Strike/Slip. Since 1975 he has served as editor and publisher with Brick Books, and taught Creative Writing and English at the University of Western Ontario and the University of New Brunswick. He edited The Fiddlehead from 1991 to 1996, and has served as faculty resource person at Sage Hill and Banff, where he currently holds the position of Senior Poetry Editor. He has connections with Ontario, New Brunswick, Saskatchewan and British Columbia, where he currently resides.